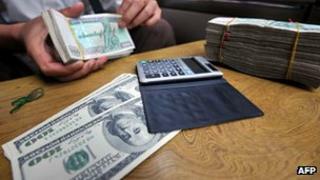 It set a rateof 818 kyat against the US dollar on Monday, the first business day since moving to a managed float. Prior to being floated, the kyat had an official as well as a black market rate, which analysts said deterred firms from investing in Burma. Under a managed float system a currency's exchange rate is determined by the market. However, the central bank publishes a daily reference exchange rate to influence the market. There will also be occasional interventions in the market to support or depress the currency. "Foreign investors can have now have a certainty about the security of their investments in the country," Tony Nash, managing director of IHS Global told the BBC. There has always been a huge difference between the official exchange rate and the one in the black market over the years. Analysts said firms that have been able to access the official rate have benefited as their import costs have been low compared with those who have had to use unofficial rates. Sean Turnell of Macquire University said the disparity in rates had "been a most extraordinary invitation to corruption". However, as the authorities float the currency and set an exchange rate that is almost equivalent to the one being offered in the black market, it is likely to help provide a level playing field to all domestic companies. "This float, which unifies the exchange rates, removes that corruption incentive," Mr Turnell added. Viewpoint: Can a free-floating currency boost Burma?